← My First 10k Race: Where is that finish line? I love running Half Marathons! Within the past year I have run four. In a week I will run my fifth (NYRR Manhattan Half) and then I look forward to the NYC Half on March 15 and the More Magazine/ Fitness Magazine Women’s Half on April 15. I figure eventually all these halfsies will lead me to a whole: specifically the ING NYC Marathon. How did I get to this point? Here’s the story of my first half marathon. 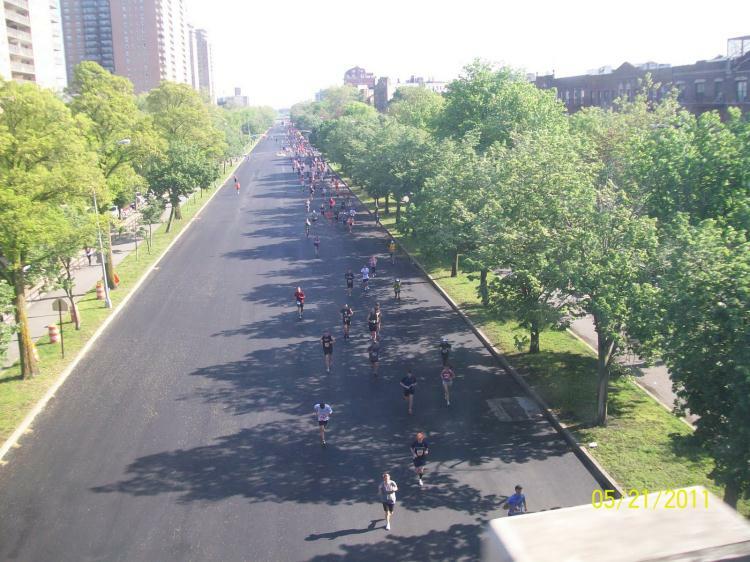 I ran my first Half Marathon in May 2011, the Brooklyn Half. It was a beautiful Spring day and my first time running 13.1 miles. I ran that race with my Dad and sister. My sister is a lot faster so I only saw her for hugs at the Start and Finish line. My Dad, who is my running buddy, stayed with me for a few miles in Prospect Park but then I gradually drifted away around mile 4. He, being a very experienced runner, kept telling me to just follow my feet so I did just that. I had no strategy or plan of attack. I was just focused on finishing. I didn’t care about my pace. I didn’t care about my NYRR Account Profile and what race times would appear. Being a newbie to the racing community and entering it without any sense of competition my only real fear was that I would fall behind in the pack as everyone passed me and when I got to the finish line they would have already started packing up. Back then I didn’t even feel I could call myself a runner even though I did run 3-5x a week mostly with my Dad. I guess I just hadn’t caught my mind up to my body yet. The Brooklyn Half was my second race. 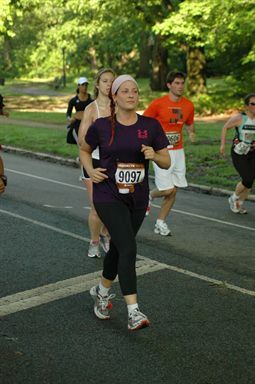 The first race I ever ran was about 8 weeks earlier, the 15k Colon Cancer Challenge (March 2011). For that race I was giddy with enthusiasm just over being a participant that it wasn’t until I looked at my time and ranking on my NYRR profile that I realized I was quite close to being the LAST one to finish! Last?! Oh, was that why as I came around mile 8 there were so few runners around me? And why when I crossed the finish line – smiling, arms up like a champ – I felt like I had joined a party that had been going on for hours? What did I know about running races? Nada. So the fact that during that 15k race there were merely 149 runners behind me was a smack on a pride I didn’t even know existed in me. So my strategy for the Brooklyn Half was simple: Don’t Be Last. 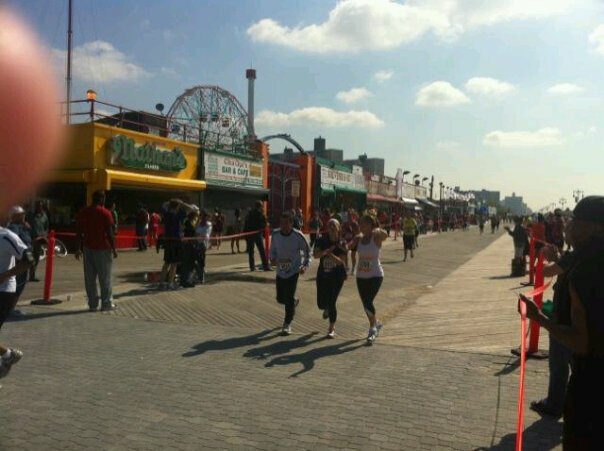 I had this fear of running alone, watching every runner pass me by, as I struggled to get to the Coney Island finish line. My Dad said the biggest mistake runners make is they start out too fast and then crash. He kept reminding me to take it easy and not get caught up in the rush because later on I will pass a lot of these runners who were flying by me. Wise advice except it sort of messed with my head after knowing how I ranked in my last race. What if I go too slow? Like a sign from God, as I was settling into the run around mile 5 there was a girl just up ahead of me wearing a T-shirt that read “DON’T BE LAST!”. I took a moment to get a sense of my surroundings. There were a lot of runners still behind me and I saw quite a few stopping on the sidelines at fluid stations or to stretch. I suspected my Dad hadn’t passed me cause surely I would have seen him. So I calculated that there were at least 40 runners who will definitely be behind me. Phew, I won’t be last and I won’t be alone in the end! When we came out of running the two shady loops in Prospect Park and hit the sprawling, flat Ocean Parkway in a beating Spring sun my heart skipped a few beats in awe. I was about to run up a highway ramp! Where are the cars? Do I need to look both ways? Can my body do this? There were all kinds of shapes, sizes and ages around me and ahead of me. In the time it took to absorb this thought I was coming down the ramp onto the parkway, finding my strength from the pack of runners all around me. If they are doing it, I can too. And off we merged onto Ocean Parkway. I thought, “So this might be how it feels running the NYC Marathon, running major roads and highways that are shutdown just for the runners.” I loved that sensation. That was the moment I actually decided I would one day do the marathon. I may have been at Mile 8, not having even run 13.1 miles yet but that image of the Ocean Parkway leading the way to Coney Island sealed the deal for me. I want to experience that kind of roadway all over NYC! Give me the Verrazano Bridge, the BQE… I want to run the streets of my city. The sensation of running an actual highway where cars zoom by was energizing. Passing traffic signs with speed limits and running through red-lights gave me a real charge. Of course I had trained on the streets in Staten Island plenty but I had to work around the bustle of traffic. This time the roads were only for runners. It was also one of the first warm days of Spring and the sun was beating hard so we all kept to the shade of the trees. It felt great. As I merged onto Ocean Parkway there was a lone man cheering. He said, “You’re halfway done! The finish is just down this road.” Ha, just another 6-ish miles. That flat run on the parkway was long and quiet. There were no cheerers. But occasionally an elite runner who had probably finished an hour earlier and now decided to run back on the course towards Prospect Park would shout a cheer like “You can do it runners! Push it!”. I felt grateful and inspired to think that I was able to participate in a race with other runners that were a hundred times faster than me. The end was nearing when I approached the boardwalk at Coney Island and saw the Parachute Ride and Ferris Wheel in the near distance. When I turned the corner in the parking lot with my feet pounding the boardwalk’s wooden planks, heard the Black Eyed Peas “I Gotta Feeling” blasting and crowds cheering around the finish line, I actually felt a little sad it was all about to come to an end. I wanted more! I knew I had more in me. I remember looking at that Finish Line as I was passing Nathan’s Hot Dog stand and the Verrazano Bridge far off in the distance, with my husband and sister on the sidelines screaming for me, and thought that if I had to run another 5 miles I absolutely had it in me to go the distance. I felt so proud of myself for discovering I had 13.1 miles in my legs. After I finished (2:31) and enjoyed a few bites of an apple we all gathered near the finish line straining to see my Dad come through. About seventeen minutes later I spotted him in the distance and we started hooting and hollering like no one else around. As he got closer, my sister and I busted back out on the course to help bring our Dad home. A cute fact about Coney Island- my parent’s, who have been married 44 years, had their first date on the Parachute ride which is just to the right of the finish line. Now another special memory was made in that same spot – finishing the Brooklyn Half Marathon with his two daughters and a smile across the finish! Me and my sister bringing our 67yo Dad into the Finish Line! Those were some pretty awe-inspiring pictures. Great recap! glad you thought so. it’s really amazing to see it in person when you’re running. thnx. Cried when I read the part about you going back for your dad! I cannot wait to run with my daughter. What an amazing memory. Thanks for sharing! Great post, as usual! I agree about there something so much better about running in the street! you motivate me so much, and i am loving these photos of BK! man, i miss new york. aww, thank you so much!!!! I applaud your dedication and raw power! One Month Until NYC Marathon 2013!